Choosing the right garage door for your business isn't as easy as it may seem at first. However, Solution Garage Doors can provide you the information you need to make the best choice for your operation, and offer you the opportunity to choose from the largest selection of leading quality commercial garage doors the industry has to offer. What are Commercial Garage Door Considerations? Insulated & non-insulated sectional garage doors Easy, silent operation and good looks. 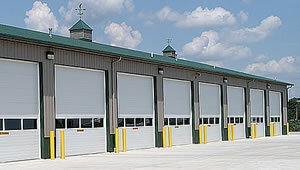 Commercial-grade rolling garage doors Superior strength, low maintenance. 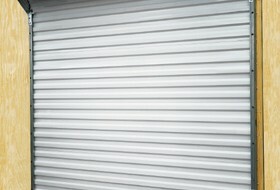 Commercial Sheet and Rolling Sheet Garage Doors Economical, best paint warranties. Service fire doors Property damage protection and sound proofing. Security grilles Durable and attractive. Even if you have a small business, it's a wise investment to buy a commercial grade garage door rather than a heavy-duty residential garage doors. 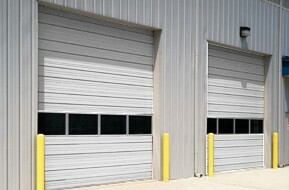 Commercial garage doors are built to endure far greater usage than their residential counterparts. Let us work with you to choose a commercial garage door to fit your needs and your budget. Get a free estimate for a garage door installation or repair by our team of a combined 20 years of experience. 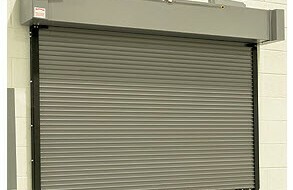 If you need a high level of insulation, easy and silent of operation, and an aesthetic appearance, then commercial grade sectional doors are your best option. Sectional garage door operation is superior due to ball bearing rollers and the use of 30 pounds of force or less to initiate door movement. When appearance is a major concern for your business, sectional garage doors have the most extensive selection of exterior appearances with various baked on enamels, custom finishes, and window and insulation types. R-values can be as high as 17.2, enabling eligibility for energy related government tax credits. Although maintenance—as well as initial cost of purchasing a sectional garage door—are higher than that of a rolling or sheet garage door (due to it's greater number of moving components), sectional garage door parts are easier to replace. 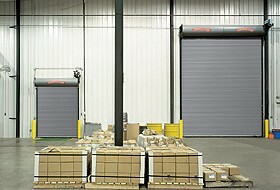 If durability and cost of maintenance are your main concerns, then rolling doors are your best choice. Although insulation level options aren't as comprehensive as with sectional garage doors, rolling garage doors offer the highest level of strength with their superior wind and damage resistant slat construction, and are ideal for spaces with limited room, being one of the most compact garage door styles available. Commercial-grade rolling garage doors require virtually no maintenance, as their guides are made of heavy-gauge structural steel, and the spring is enclosed in a barrel and hood. If your business doesn't require a garage door with thermal control or a lot of built-in impact resistance, sheet garage doors can be an economical option, being the cheapest of all commercial garage doors. Commercial sheet and rolling sheet garage doors have the best paint warranties in the industry. For rolling type sheet garage doors, lubrication can be difficult, because the spring is located in the barrel. Sheet doors and their installations are typically more affordable than sectional garage doors. However, if the door is damaged, the entire door needs to be replaced, and if a rolling sheet door spring is damaged, the entire barrel would need replacing. Service fire doors are available insulated and non-insulated. However, the best service fire doors offer a combination of insulation, sound proofing, and the necessary degree of property damage protection. Dual purpose mineral wool insulation provides varied degrees of protection, depending on whether the wall on which they're mounted is masonry or non-masonry. For a level of thermal protection from outdoor elements, mineral wool is compressed within each slat of a rolling service door. Fire doors are also equipped with various forms of fire sensors, such as FireLite ™ and Fire Sentinel ™ vision lights. Look for features like Chain Reset Hoist and Fire Minuteman that eliminate having to release the tension spring on your fire door when it's in fire drop mode, and permit resetting of the door by one person. What are the Differences Between Commercial and Residential Garage Doors? Industrial and commercial grade garage doors and their openers are built to endure 100 or more cycles a day. These doors are built and finished to withstand severe weather conditions with their superior wind load and rust resistant construction, and designed with a greater resistance against damage from heavy equipment contact. Some commercial garage door models are built to take up less room, others are designed for higher opening and closing speeds. Some incorporate a focus on visual optimization such as glass garage doors used by some auto repair establishments, and polycarbonate rolling grills such as the ones used to protect financial institutions and businesses in shopping malls.